The Congress in Haridwar, home constituency of Harish Rawat, is a divided house with a majority of party leaders supporting the local parliamentarian. They term as inappropriate the decision of the party high command to appoint Tehri Garhwal MP Vijay Bahuguna as Chief Minister. The continuing standoff between the rival factions of the Congress in the state have given rise to a series of speculations that are now being discussed across the state. The sleepy town of New Tehri, the district headquarters of Garhwal, will soon be getting a facelift. 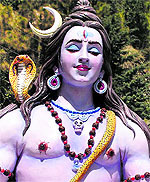 The Municipal Council that has begin the beautification exercise by installing the statues of gods and goddess on the chowks of the town from today. Who will be the CM? "By not making arrangements for providing green bonus in the Union Budget this year for the suspended hydroelectric projects in the state of Uttarakhand, the Finance Minister has done injustice to the state in the Budget of this year," said Suresh Joshi, general secretary of BJP Uttarakhand. Dehradun March 16 Vipin Panwar of Jogiwala, who got married only four days ago, lost his wife Kavita in an accident near IIP, Haridwar, in the afternoon. Panwar, who was driving down to Luxor to take his wife to her parental home on a motor cycle applied sudden brakes on seeing a four-wheeler closeby. Because of the abrupt jolt, his wife who was riding pillion fell down and came under a speeding bus. With the Uttarakhand BJP ready to put the Congress on the mat, the election for the post of the Speaker of the newly elected Uttarakhand Legislative Assembly on March 26 would be an acid test for Chief Minister Vijay Bahuguna. Members of the Students Federation of India (SFI) protested in front of the premises of the District Magistrate in the city today in protest against foreign direct investment (FDI) in higher education. Almora MP Pradeep Tamta today denied the news items carried by some sections of the press that their group in Uttarakhand Congress was floating a new regional political party with BJP support to topple the Bahuguna government and make Rawat as Chief Minister of Uttarakhand. “We cannot do so as our fight is to get justice within the party forum,” said Tamta over the telephone from New Delhi to this correspondent today. A five-day training programme for Indian Council of Forestry Research and Education (ICFRE) scientists on ‘Environmental impact assessment’ concluded at Forest Research Institute (FRI) here today. The Yuva Sarafa Mandal team beat the Cricket Assocation of Uttarakhand (CAU) team by 7 wickets in a match in the 60th District Cricket League here today. 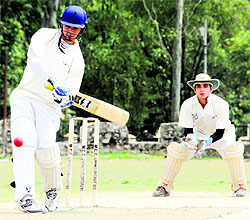 The CAU team scored 121 runs at the loss of 10 wickets. Rahul was the highest scorer for the team with 60 runs. Ankur and Farman took 2 wickets each for the Yuva Sarafa Mandal team. After three days of investigations, Haridwar police today arrested the murderer of a 16-year-old school girl, who was killed just adjacent to her home in Kankhal on Monday earlier this week. The murderer, Pawan, resident of village Dalludhanaura, district Bijnore, Uttar Pradesh,was arrested near Shankaracharya Chowk on a tip-off from an informer in the afternoon. Congress councillors, led by their leader Ashok Verma, met Chief Minister Vijay Bahuguna today. Two persons were injured while a utility vehicle loaded with government ration that was heading towards Kua village from Thatyur town turned turtle near Kua village today. Though a majority of Harish Rawat supporters are camping in New Delhi, Congress activists here are refraining from protesting openly as they are doing in the Teen Moorti lane, Rawat’s official residence in the National Capital. City Congress chief OP Chauhan, who is assisting Harish Rawat in New Delhi since Vijay Bahuguna was declared Chief Minister, told The Tribune that as 17 MLAs were supporting the Haridwar MP the high command should reconsider its decision. “We are with Harish Rawat as he was instrumental in steering the Congress to power in the Assembly elections in 2002 and this time too. Even in Haridwar where the Congress had never won in the past 20 years, Harish Rawat had emerged victorious with a record margin in 2009. At least the high command should have considered the 40-year-long political career, good image and experience of Harish Rawat before deciding on the chief ministerial candidate,” said Chauhan, who along with other dissident legislators met party general secretary Ahmed Patel in New Delhi late last night. Dr Sanjay Paliwal, a former minister in the Narayan Dutt Tiwari-led state government, who is camping in New Delhi, said till Harish Rawat was made the Chief Minister of the state, they would continue to protest. An unfair treatment was meted out to Harish Rawat who had been serving the party with loyalty for the past 40 years. A large number of activists of the Youth Congress cell are also supporting Harish Rawat, owing to their proximity to his son Anand Rawat. Anand Rawat is the president of the Uttarakhand Youth Congress cell. Ravish Bhatija, chief of the Haridwar city wing, told The Tribune over the phone that it was a now or never situation for them as in 2002 Harish Rawat had quietly accepted Tiwari’s appointment as Uttarakhand Chief Minister. But this time we would not let the high command ignore Harish Rawat once again. Unhappy with blatant defiance of Congress president Sonia Gandhi’s decision by the Rawat faction, Dr Santosh Chauhan, former Uttarakhand Women Commission chairperson and women face of the Congress in Haridwar, said discipline and development should be the priority of the Congress workers. She added in politics personal interests, ego and motives should always be secondary as no one was above the party. “If seasoned party leaders openly disobey the directive of the high command, how can we expect the younger generation of Congress activists to obey our orders? The development of Uttarakhand should be our foremost motive. Vijay Bahuguna is a deserving candidate with a development vision for the state,” said Chauhan. Chauhan was denied a party ticket from the Ranipur-BHEL seat allegedly under pressure from the Harish Rawat group. Braham Swaroop Brahamchari, a state PCC member and Harish Rawat’s bête noire, is supporting Vijay Bahuguna’s appointment as Chief Minister. Brahamchari said Bahuguna’s development-oriented approach would ensure wholesome development of Uttarakhand. He urged the dissident MLAs to cooperate in the smooth running of the Congress government in the state. With the loyalists of the Harish Rawat camp failing to budge from their position and the newly elected legislators having refused to turn up for taking the oath of office yesterday, the question doing the rounds is whether a new political outfit is in the offing in the state or not. Some of the reports appearing in the vernacular media have come out saying that the birth of an ‘Uttarakhand Congress’ is on the cards and the outfit would become a reality very soon. On the issue of Rawat’s position, which is far from clear, observers and the sources in the Congress say that the leader is under tremendous pressure from his supporters not to bow to the “whims and fancies” of the party. His followers are in no mood to go on the back foot this time and have been saying that time after time Rawat and his supporters have been denied their due in the state politics. “When the party was nowhere in picture, it was under Rawat’s leadership that it came to power in 2002. At that time, the party had chosen to make Narayan Dutt Tewari the Chief Minister while handing the olive branch of a Rajya Sabha tenure to Rawat. This cannot be allowed to be repeated,” said one of the Rawat supporters. While Rawat has been claiming that he is a disciplined soldier of the party who would not go against it and would raise his discontent while still being in the party, the conduct of his supporters has been contrary. The reports of the top-level leadership of the BJP being in touch with him since the drama began once the name of Vijay Bahuguna was declared the Chief Minister has further fuelled all sorts of speculations. There is a farfetched line of thought that says that he might join hands with the BJP if some formula works out. Another speculation doing the rounds is that while his supporters would help Bahuguna prove majority on the floor of the house and also pass the vote on account, they might work against the interest of the party when it comes to the Rajya Sabha poll for one seat scheduled to be held in the end of the month. The Rajya Sabha poll is expected to be a litmus test for Bahuguna and the Congress would require the support of Independents and the BSP if it wants to send its candidate to the upper house of Parliament. A loss on this front would be a major embarrassment to Bahuguna. Observers say that the situation at this point of time remains fluid and everyone is keeping a vigil to see who blinks first, the Congress leadership or the Harish Rawat camp. New Tehri was established under the rehabilitation programme for residents of the old Tehri town that was submerged under the reservoir that was constructed to build the Asia's highest hydro-electric dam. The Tehri dam authorities had termed the New Tehri town as a tourist destination of the state but nothing substantial was done to attract the tourists until now. According to the MC President, New Tehri, Umesh Gusain, the MC is taking the onus of attracting tourists and decided to adopt several measures in this regard under which the beatification of chowks with the statues of gods and goddess began. He further said every chowk would be decorated and would have a statue so that it provided a pleasing look for the incoming tourists. Gusain further said the Municipal Council was also planning to establish an eco-park similar to the one at Dhanaulti so that the tourists could spend a day more in New Tehri. Gusain also informed the media that a proposal for establishing an eco-park in association with the Tehri Hydro Development Authority was also in the pipeline along with a deer park near the Collectorate. President of the Himalayan Paryatan Sanghatan Kamal Singh Meher commended the efforts of the Municipal Council and also demanded that a lake view point at Doongidhar should also be developed so that the tourists could enjoy the scenic beauty of the lake from there. He also said the council should also install chairs and benches at the various bus-stops for the tourists and the local commuters. Gusain said the town had immense prospect of becoming an important tourist destination and the Municipal Council was working towards achieving that goal and the results would be seen in near future. Commenting on the Union Budget, Joshi said that the Congress Party, which has shed fake tears during NDA rule at the Centre, blaming that the NDA was neglecting the state, has shown its real intention that the party only wants to use the one crore people of the state for the political purpose only. "By not renewing the industrial package, given during NDA regime, the Congress at Centre has also revealed its intention of not being the well-wisher of the state," said Joshi. The BJP general secretary said that the five Members of Parliament of the Congress from the state had been deceiving the people of Uttarakhand that if their government came to power in the state, the Centre would release a special financial package for the state, but the Union Budget for this year had shown that Centre did not care for the people of the state anymore. "Even in Rail Budget, the Union Railway Ministry had neglected the state fully it did not pay any heed to the demand of railway lines between Tanakpur and Bageswar, Dehradun and Kalsi and Doiwala and Hrishikesh. It also neglected the demand of a broad gauge line between Tanakpur and Pilibhit," said the BJP general secretary. The BJP general secretary lamented that Dehradun is the only state capital in the country which has not been linked with Rajdhani Express trains by Railways.
" The border state of the country had been neglected by the Union Railway Minister this year," said Joshi. Vipin Panwar of Jogiwala, who got married only four days ago, lost his wife Kavita in an accident near IIP, Haridwar, in the afternoon. Panwar, who was driving down to Luxor to take his wife to her parental home on a motor cycle applied sudden brakes on seeing a four-wheeler closeby. Because of the abrupt jolt, his wife who was riding pillion fell down and came under a speeding bus. The nervousness of the Congress that is dependent on outside support to first elect the Speaker on March 26 for functioning of the House that would convene on March 27 would be exploited by the BJP, which is readying to have a one-on-one with the Congress. The BJP is keen to field it’s candidate for election to the post of the Speaker that would put the fragile claims of the Congress to test. “Our leaders are already in Delhi to participate in the parliamentary board meeting for selecting the name of the candidate for the post of the Speaker. We would also be putting up our candidate for the election to the Rajya Sabha as well,” said a senior BJP leader. With a section of MLAs supporting senior Congress leader Harish Rawat not ready to drop the ante, the Congress is still groping in the dark about the actual number of MLAs in it’s camp. Even if the dissenters fall in line, the trouble for the Congress would be far from over. As of now the three Independent (Congress rebels) MLAs of Uttarakhand Kranti Dal (UKD) have extended support to the Congress, but even if one of them abstains on March 26, when the election for the post of the Speaker would be held, the situation may go out of hand for the Congress. Besides, there is no certainty which side the BSP members would go, though they, too, have extended their support to the Congress. The survival of the Congress government depends on the election of the Speaker. With the political situation more in favour of the Independents, the situation is quite fluid, said a senior Congress leader. Though the Congress leadership is yet to declare it’s candidate for the post of the Speaker, the choice before the Congress, political observers say, is either to elevate the pro tem Speaker, Shailender Mohan to the post of Speaker, or bank on the experience of Uttarakahnd Congress president Yashpal Arya. However, sources maintain that it remains to be seen if Arya would accept the post of Speaker as sources maintain that he is keen on a Cabinet berth in the Bahuguna ministry. 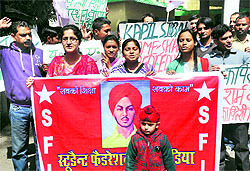 The students also ranted slogans against Union Education Minister Kapil Sibal. District general secretary Amit Kumar said the few options left for the people of the poor strata to study in higher academic institutes would also finish with the entry of foreign investment in higher education which would not be tolerated. Those who participated in the protest included district secretary Shanti Prasad, Pankaj Badhthwal, Poonam and Pallavi Shrivastav. The main spokesperson of Harish Rawat, defiant leader of the Congress, seeking his elevation as Chief Minister of the state, said that their intention was never to damage the party and to have connivance with the communal forces only to become a Chief Minister of the state. “Rawatji has categorically denied several times that his fight is to get justice within the party rather than to weaken the party in the state and the nation,” said Tamta. Asked if their group will vote for the Congress government at the time of vote-on-account motion on March 29, Tamta said that they hope to have an amicable situation on leadership of the government in Uttarakhand before that. “We hope that the revolt of Uttarakhand congress legislature for justice to Harish Rawat, who has spent his entire political life in service of the party, will bring some fruits and the Congress high command will get an amicable solution acceptable to Rawat loyalists.” said Tamta. Addressing the valedictory function of the training programme, Saibal Dasgupta, Deputy Director, ICFRE, hoped that the participants had developed some basic understanding and skills of EIA during the short-term training course. He gave away the certificates to the participants. The head of Forest Ecology and Environment Division, FRI, and the Course Director, Dr Laxmi Rawat, said during the course of the training programme, the resource persons gave their presentations on the EIA legislation, accreditation and procedure for EIA on consultant organisations in India and EIA notification 2006. A field trip to the Tehri Hydroelectric project was also arranged for the participants. Dr Mridula Negi conducted the valedictory function and also proposed vote of thanks. Dr Nirmal Ram and Dr Pramod Kumar, scientists from FRI, were also present on the occasion. Fifteen Environmental Scientists from eight institutes of ICFRE participated in the training programme. The Yuva Sarafa Mandal team beat the Cricket Assocation of Uttarakhand (CAU) team by 7 wickets in a match in the 60th District Cricket League here today. The CAU team scored 121 runs at the loss of 10 wickets. Rahul was the highest scorer for the team with 60 runs. Ankur and Farman took 2 wickets each for the Yuva Sarafa Mandal team. The Yuva Sarafa Mandal team easily got to the target score ensuring a 7-wicket win for itself. Farman scored 40 runs. Honey, Tony and Amit of the CAU took one wicket each. After three days of investigations, Haridwar police today arrested the murderer of a 16-year-old school girl, who was killed just adjacent to her home in Kankhal on Monday earlier this week. The murderer, Pawan, resident of village Dalludhanaura, district Bijnore, Uttar Pradesh,was arrested near Shankaracharya Chowk on a tip-off from an informer in the afternoon. Pawan was a neighbour of deceased Nisha Kashyap, a student of class IX, Government School. Pawan killed her after he tried to molest her while she had gone just outside her home and was talking on her cell-phone, near vacant agricultural fields. When Nisha resisted by slapping Pawan, warning him that she would inform her parents about his advances, Pawan forcibly took her to nearby agricultural fields and killed her by pressing her neck. Signs of nail scratches were also found on the face of Pawan, indicating the resistance shown by Nisha before she was killed. After killing Nisha, Pawan also hid her cell-phone in the field. The police recovered the phone today from spot after Pawan’s disclosure. Kankhal station police officer Mahesh Joshi said that initially it was believed that three youths connived the murder of Nisha as they had had an altercation during Holi, as they tried to forcibly play with her. They had tried to close in with her in an inebriated condition. But as Pawan’s nature was found suspicious since that very day, the police also interrogated him, who, since then, was found missing. But today on an informer’s tip-off, he was arrested by the police. Nisha, daughter of Vijendra Kashyap, was found murdered on Thursday morning after she was missing from her home since Tuesday evening. After an intense search, her family members found her body lying in a vacant agricultural plot just adjacent to the house near the Haridwar-Kankhal bypass. Prima facie, too, her death appeared murder as sharp impressions on her neck and body were visible, indicating resistance from the deceased. A case was registered at Kankhal police station by Nisha’s father, naming three village youths - Ravi, Alok and Kamlesh - as suspected killers. This theory was, however, found untrue. They congratulated him for his success and at the same time also apprised him of the problems people face during monsoon every year. Verma said the disaster management was poor in the city. During the rains, water entered many residential areas. He held the PWD and the Dehradun Municipal Corporation responsible for not doing the needful to give a relief to the aggrieved residents of the city. He urged the Chief Minister to identify affected areas and take timely action. Bahuguna gave them an assurance that their suggestions would be duly considered. Meanwhile, members of the Sikh Mahasabha and the Gurdwara Management Committees also met Bahuguna at Bijapur Guest House in the morning. President of the mahasabha Harpal Singh Sethi presented a sword to Bahuguna. The local administration and the 108 EMRI ambulance service rushed to the spot and transported the injured to the nearest hospital in Mussoorie. control of the vehicle, which turned upside down with all the loaded goods on the road, resulting in serious injuries. The other person, Dalebu, aged 65, who was also accompanying the driver, was injured grievously. The doctors at Mussoorie hospital said that both had received serious injuries but were out of danger.